How to rip a cd to mp3 in win 10? How to Rip a CD in Win 10? Best program to rip audio CD on Windows 10? What’s the best way to rip CDs to a Windows 10? Can I use Groove to rip music CDs to my local hard drive? CD, short format of Compact Disc, is a digital optical disc data storage format. An Audio CD is a music CD like that you buy in a music store for play on CD player. Music is stored on Audio CDs can be MP3, or uncompressed digital data with no data lost, exactly as in WAV digitally encoded files. This tutorial will show you step by step how to rip (copy) music from a audio CD to your Windows 10 PC. 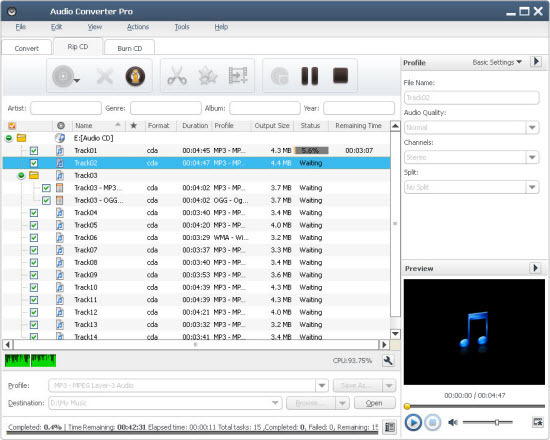 UFUSoft Audio Converter Pro is a professional CD Ripper, CD converter, CD burner, audio converter, audio editor for Windows 10. It convert CD to nearly all audio formats FLAC, AIFF, MP3, WMA, WAV, AAC, OGG, APE and many others, and make CDs available on different music players. It can batch convert among all sorts of audio formats (including MP3, WMA, WAV, AAC, FLAC, OGG, APE, AIFF, SHN, TAK, Apple Lossless ALAC), extract audio from different format video and HD-video files (AVI, MPEG, WMV, MP4, FLV, MKV, H.264/MPEG-4 AVC, AVCHD). CD Ripper for Windows Supports all Windows systems including Windows 10, Windows 8, Windows 7, Windows XP, Windows Vista, and Windows 2000. How to Rip CD to FLAC, AIFF, OGG, MP3, WAV, WMA, M4A, M4R, etc on Windows 10 with UFUSoft Audio Converter Pro? Take rip CD to FLAC in Windows 10 for example. Click on “Profile” drop-down to choose “FLAC – Free Lossless Audio Codec” from “Lossless Audio Format” category. Click on the “Rip” button start ripping CD to FLAC, AIFF, OGG, MP3, WAV, etc. in Windows 10. « How to Rip CD to FLAC/MP3/WAV/WMA/AAC/ALAC on Mac?